Can listening to a story help you solve problems? Communities from all over the world use folktales to convey cultural beliefs and practices. In parts of Liberia, elders tell folktales to children in the palaver hut, a place the community also uses for conflict resolution. 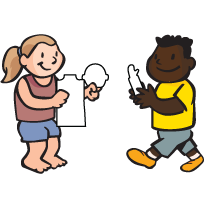 Print out the story “Head, Body, Legs.” Print out and cut a paper body part for each student from the templates (some students may have to share, or some may have multiple parts so that the numbers are even). Cut enough so that the body parts add up to a number of total bodies. Ask children to sit in a circle, then ask them if they have ever read or listened to stories or fairy tales with their families. What kinds of stories have they read? Where do they read the stories? Explain that in the country of Liberia, people in some communities share stories with each other in a place called the palaver hut, and they sit in a circle while they share the stories. Often, the stories have an important message about how people in a community should behave. Listen to this Liberian folk tale, and try to put together your OWN head, body, and legs! Explain that you are going to tell a story passed down from generation to generation in Liberia. Ask your students if they know the words that start many fairytales. In Liberia, “Once upon a time” begins a story, and the listeners repeat the word “time.” Practice this, then read the story of “Head, Body, Legs” (Click here for PDF). After you finish reading the story, ask your students if they noticed any lessons the story teaches us. Brainstorm some ideas. After a minute of brainstorming, bring the conversation around to the idea of cooperation. Tell your children that you would like to teach them a game that requires teamwork and cooperation. Pass out a body part to each student. Explain that there are enough body parts to create several whole bodies. Ask your students to stand up, and in 45 seconds, match up with other students to create whole bodies. After they have created their “bodies”, bring your students together away from the materials to talk about what they have discovered. Was that easy to do or was it difficult? What could they try to make it easier? What could they try to make the game more challenging? Brainstorm a list of new game rules (or suggest some of your own) that might make the game harder or easier. After trying some of these new rules, bring your students back to a seated position in the circle/palaver hut. Ask them to “tell the story” of their experience working together today. What went well? What could have gone better? What other ways could they have worked together to create the bodies? If they were telling the story of their day together, what would be the lesson? Instead of paper cut-outs, you can use recycled materials for the body parts. Dowels can become arms or legs, a paper plate can become the head, etc. Explain that Liberian communities also use the palaver hut to help solve problems in a community. If two people have a disagreement, they go to the palaver hut to explain their problems to the elders, who make a decision. The palaver hut is a safe, sacred space, with no violence; people use their words to solve problems. Because it is a circle, everyone seated there is equal, and everyone can look each other in the eyes. You may want to use the palaver hut concept for conflict resolution with your students. If a conflict arises, you can gather your student “community” to discuss the problem in a circle. Many Liberian stories and other African folktales, including “Head, Body Legs,” are available as picture books (see the Africana Award list here). Using the palaver hut storytelling area, this activity can be adapted to a full week of activities revolving around folktales from African cultures. Some students may be surprised that English is the dominant language in Liberia. They may be even more surprised to learn that Liberia was founded by Americans. The American Colonization Society founded Liberia in the early 1800s as a refuge for freed African slaves from the United States. The capital of Liberia is Monrovia, named after then President James Monroe, and Liberia’s government was modeled after the United States’. Liberia is bordered by Sierra Leone, Ghana and Cote d’Ivoire. Liberia is known for its quilting. Martha Ann Ricks is one of the most famous historic quilters; she was born into slavery in the United States in 1817, and in 1892 she presented one of her quilts to Queen Victoria.